UN report says Saudi airstrikes are possible war crimes. camera (Shawn Thew/EPA/REX/Shutterstock) Secretary of Defense Jim Mattis speaks at a press conference at the Pentagon in Arlington, Va., Aug. 28,2018. American military support for the Saudi-led coalition in Yemen is dependent on that coalition avoiding civilian casualties, Defense Secretary James Mattis told reporters. His comments followed the release of a United Nations report that highlighted deadly coalition airstrikes in Yemen's three year old civil war as potential war crimes because it resulted in the deaths of thousands of civilians. 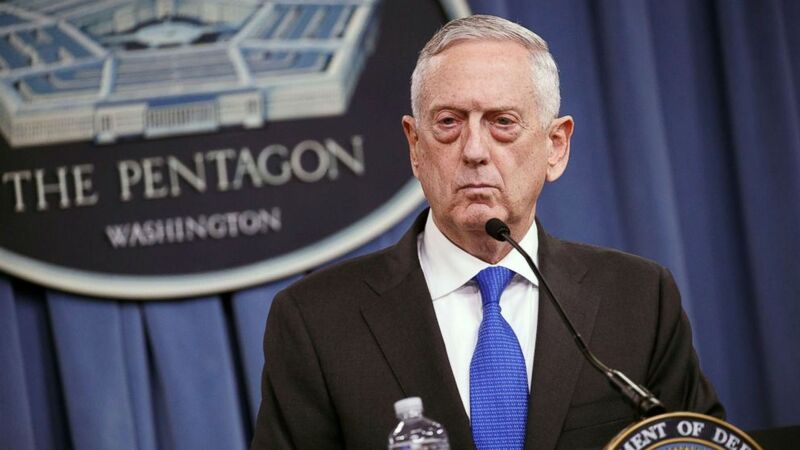 Mattis said at a Pentagon news conference on Tuesday that U.S. military support for the coalition was not unconditional and was based on the Saudi-led coalition doing "everything humanly possible to avoid any innocent loss of life, and they support the U.N.-brokered peace process." The United States provides mid-air refueling tankers to coalition aircraft, as well as intelligence used in the targeting of Iranian-backed Houthi military forces in Yemen. The emphasis of that intelligence sharing for pre-selected targets is to minimize civilian casualties that might result from the airstrikes. The secretary described the American military support for the Saudi-led coalition as driven by the effort "to try and keep the human cost of innocents being killed accidentally to the absolute minimum." "That is our goal where we engage with the coalition," said Mattis, who noted that the coalition has established "no-fire areas" near hospitals and schools. Two high-profile coalition airstrikes in Yemen in recent weeks have killed dozens of civilians, raising concerns about continued U.S. military assistance to the coalition. One of those airstrikes killed more than 40 children aboard a school bus passing close to a targeted market. "We recognize every mistake like this as tragic in every way," said Mattis. "But we have not seen any callous disregard by the people we're working with. So we will continue to work with them, reduce this tragedy." Also on Tuesday, a report to the United Nations top human rights body said the governments of Yemen, the United Arab Emirates and Saudi Arabia may have been responsible for war crimes in Yemen's civil war. The report also cited ruthless actions of the Hoithi rebels as potential war crimes. The experts who wrote the report described the damages from coalition air strikes as having killed the most civilians in the three years of fighting. They investigated dozens of incidents that resulted in thousands of civilian casualties. "Coalition air strikes have caused most of the documented civilian casualties," said the report. "In the past three years, such air strikes have hit residential areas, markets, funerals, weddings, detention facilities, civilian boats and even medical facilities." Mattis noted that the U.S. has not hesitated in raising concerns to the coalition about the need to prevent civilian casualties. "At no time have we felt rebuffed or ignored when we bring concerns to them," said Mattis. "The training that we have given them, we know has paid off. We have had pilots in the air who recognize the danger of a specific mission and decline to drop, even when they get the authority." Mattis emphasized that the U.S. goal in Yemen is a United Nations brokered settlement. "That is the goal," said Mattis. "That doesn't change, no matter what tragedy happens on the battlefield. And if what we've done in the past had reduced the loss of innocent life, then I would not want to stop doing that and think, 'There, we took care of that problem, and watch that number go up.'"